If there is ever a time when picking the wrong mushroom from what is sought is a blessing then these are it. 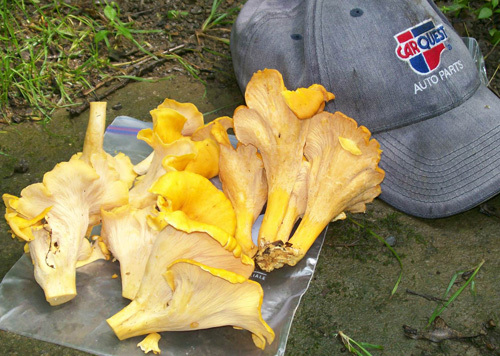 In July and August, during wet weather here in southwestern Pennsylvania, thousands and thousands of Golden Chanterelles are picked. Hundred and hundreds of the pickers of those Golden Chanterelles are probably not aware that among their basket of Golden Chanterelles are hundreds and hundreds of Smooth Chanterelles. 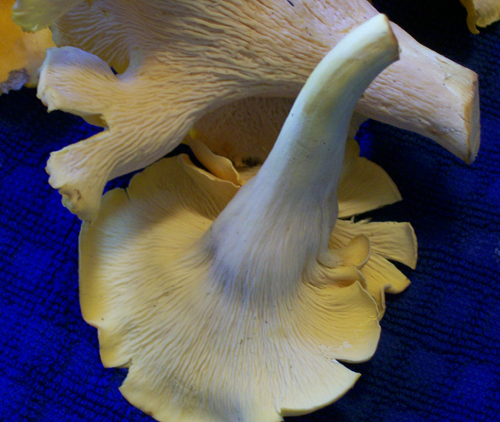 Of course, making an error such as that is a good thing because the Smooth Chanterelle is every bit as good. In fact, when the subject of Chanterelle picking comes up none of my friends that pick wild mushrooms regularly make any distinction between the two species. Smooth Chanterelles grow in the same places as Golden Chanterelles, that is, mostly in deciduous woods in our area. On occasion they can be found in pine woods. The best woods for these have a lot of oak and beech trees. Even though these are Smooth Chanterelles they are lumped in with, and commonly called Golden Chanterelles, because they are often a gold color. However they are just as often more of an orange color, like a hunter's suit, especially when young and fresh. Just about always they have a wavy margin. And when very young that margin is enrolled a bit. They can be described as having a depressed center, sometimes so depressed that they can take on a musical 'Horn-like' appearance or funnel shape. 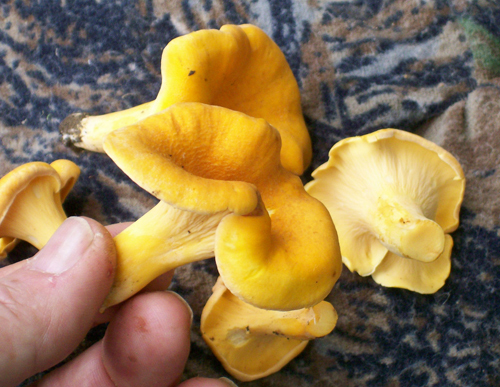 Here is a lumped group of Golden and Smooth Chanterelles. The ones in the front 'Smooth', the ones in the rear 'Golden'. Smooth Chanterelles will NOT have gills. They have very blunt, almost smooth surface where gills would be. Many mushroom guides describe the spore bearing surface as being chanterelle-like, that is, they have distinctive looking ridges rather than gills. In light of the fact that Smooth Chanterelles and Golden Chanterelles have different appearing ridges maybe those guides should be a bit more specific. 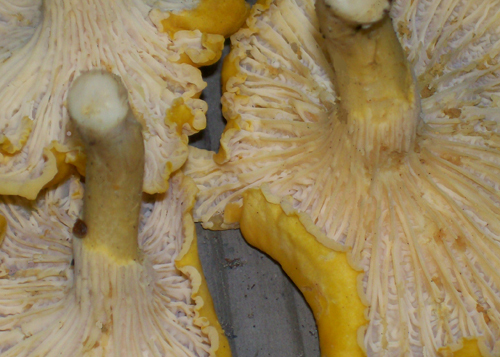 Compare these Golden Chanterelle forked ridges with those of the Smooth Chanterelle right afterwards. Sometimes the ridges are a bit easy to see and other times you really have to look close to see them. One good aspect of having barely noticeable ridges is that it makes the Smooth Chanterelle even less likely to be mistaken for a similarly colored bad mushroom that has definite gills - like the Jack O'Lantern mushroom, Omphalotus illudens. 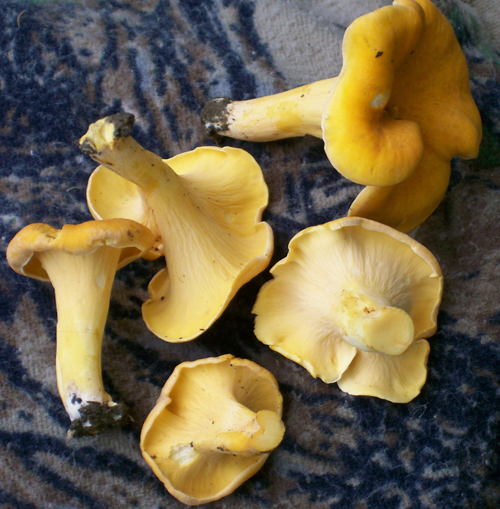 If you find gold colored mushrooms while picking Chanterelles and discover definite gills underneath leave them be. Mark the locations where patches of Smooth Chanterelles, or Golden are found in a log. Record the dates yearly. Keep track of the weather and after several days of rain in July start checking your locations. Preferably find areas in deciduous woods where there are mossy areas, like along streams, brooks, creeks, and spring seeps. Get rid of as much dirt as possible and check for bug infestation. No sense bringing home mushrooms that you will throw out during the at home cleaning process. 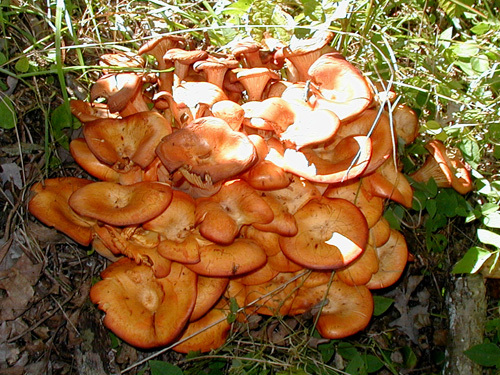 will gather the poisonous Jack-O-Lantern ( Omphalotus olearius ) mushroom which also can have a bright golden color, a depressed cap center making it appear horn shaped and often grows in the same season. However, the Jack-O-Lantern is a definite grower on wood, either trunks, stumps or twigs under the surface AND has definite gills contrary to Chanterelles. Get these characteristics ingrained and there should be no mistaken pickings. Cantharellus lateritius ( sometimes Craterellus cantharellus ) - A/K/A - Smooth Chanterelles. DATE - June 25, July 12, 15 and 22, August 7, 2010. FOUND - 'Laurel Hill State Park, Forbes State Forest near Kregar, Pa. and Stahlstown, Pa. area. Growing in mixed hardwoods with mostly beech and oak. Found along with Golden Chanterelles. Weather conditions were dry for several days. Generally the season has been dry during the end of July and early August. This particular area however is very damp on most occasions, even in dry weather.